How does the education section of your LinkedIn Profile look? Did you bother to enter any details at all? And if so, how much detail? Ever given it any thought as to WHY you should pay decent attention to this area? I’ll give you 5 reasons here and now! Start telling the story of the professional you are today! That seems to be stating the obvious doesn’t it? What if your qualifications are no longer relevant? Should you still list them? YES I’ll get to that in the next 4 points. Firstly list all relevant qualifications. You should always list your highest qualification. Relevant or not. It does show at what academic level your thinking is (or at least once upon a time was). This is quite an interesting one! Keywords, does that ring a bell? What is your ideal client, employer or customer looking for? They’ll use the search option in LinkedIn of Google, so your profile needs to be keyword rich. What better way to tuck in some keywords than right at the bottom of your profile. Have a look at my profile, Petra Fisher LinkedIn Profile, and scroll down to my college degree (2nd last entry under education). Can you see how I managed to fit the words training, trainer, coaching, coach and public speaker quite neatly and naturally even though I studied “Youth Welfare”? LinkedIn is a network and in order to network, you need to be connected. It is easy to find people you studied with (and be found by them) if you list your education properly with the right institution, course and dates. 5. Start telling the story of the professional you are today! This is where the fun and games begin! Before you can start cooking up a brilliant LinkedIn profile, you need to gather the right ingredients. If you haven’t done so already, then read this post first to get yourself organised. Your ideal client, employer or customer is looking for someone with the right skills and knowledge. Instead of just saying: ” Yup, got those”, why not SHOW you’ve got what it takes? Which of the skills or knowledge you need, did you gain/develop in your student days? Write about that in your education section. Post the description below for feedback (feel free to add a link to your profile). 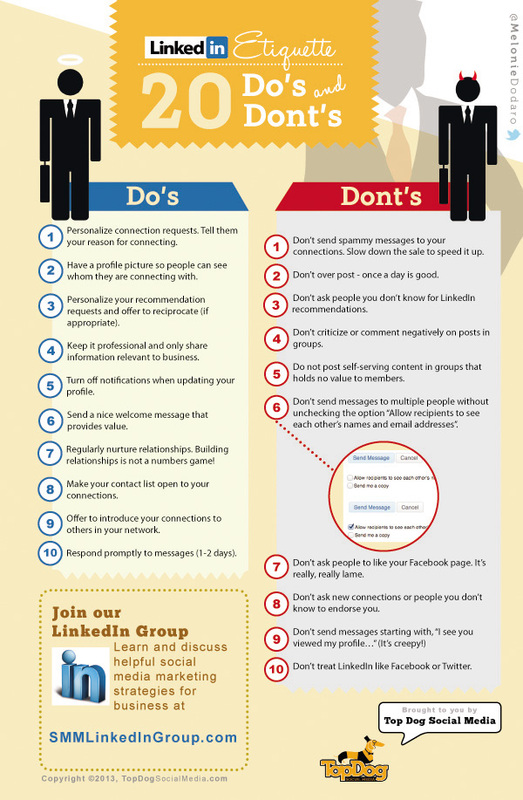 Believe or not, prospecting on social goes beyond just LinkedIn. The following infographic describes very easy ways to multiply your prospecting activity on Twitter and Facebook as well. For instance, advanced search queries on Facebook, using queries like “pages liked by women who like Intel and live in New York”, can combine multiple variables, giving you targeted focus on and results. LinkedIn’s Advanced Search feature allows you to identify decision makers and champions with complex filters through the use of Boolean search terms. You can then save your results as leads and export lists. LinkedIn is one of the older social networks, surviving changes in technology, a tough demographic and a number of challengers along the way.